I have gotten to the point in the illustration, but I am unable to figure out where to go from here. I get tricked up on the format of this Fitch exercise, but I am able to reason through it. Please help with the remaining steps. Where I am confused? Assume S and derive R ∨ P from 1st premise. 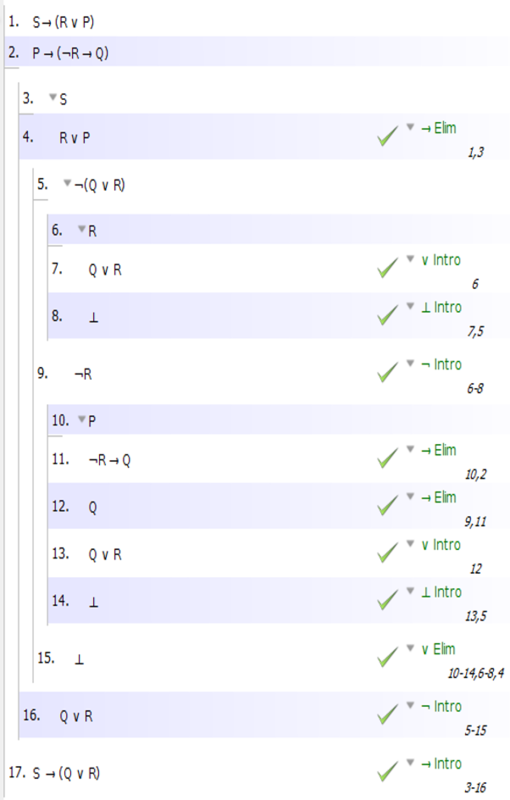 1) Assume R and derive Q ∨ R by ∨-intro, and it is done. 2) Assume P and derive ¬R → Q from 2nd premise. 2.1) Assume R and derive Q ∨ R.
2.2) Assume ¬R and derive Q from ¬R → Q and then derive Q ∨ R.
Another approach is to assume ~(Q ∨ R) as I did on line 9 below. This leads to a contradiction on line 17 so that you can complete the the other half of the disjunction. What to me is really interesting about this proof is that the subproof starting with R is used twice: as a proof by contradiction to infer ~R, as well as a proof by cases to get the contradiction. You don't see that kind of thing too often. The following is one way to prove this. The first two lines contain the premises. Since the goal is a conditional, I assumed the antecedent, "S", in a subproof starting on line 3. My goal was to reach the consequent, "Q v R", which I did on line 13. 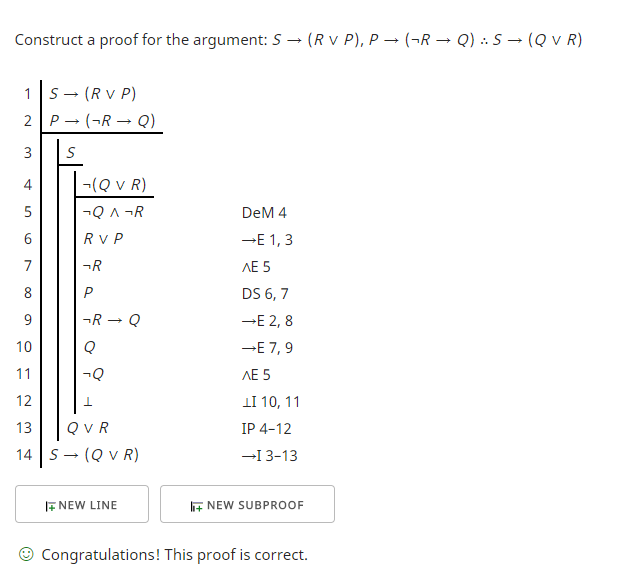 This allowed me to discharge the assumption and close the subproof by introducing a conditional to complete the proof. To get to line 13, I assumed the negation of that consequent I wanted to prove by starting a new subproof. I aimed to reach a contradiction which I did in line 12. Using the disjunctive syllogism (DS) on line 8 allowed me to cut short testing the two cases of the disjunction on line 6. Not the answer you're looking for? Browse other questions tagged logic proof symbolic-logic deduction fitch or ask your own question. 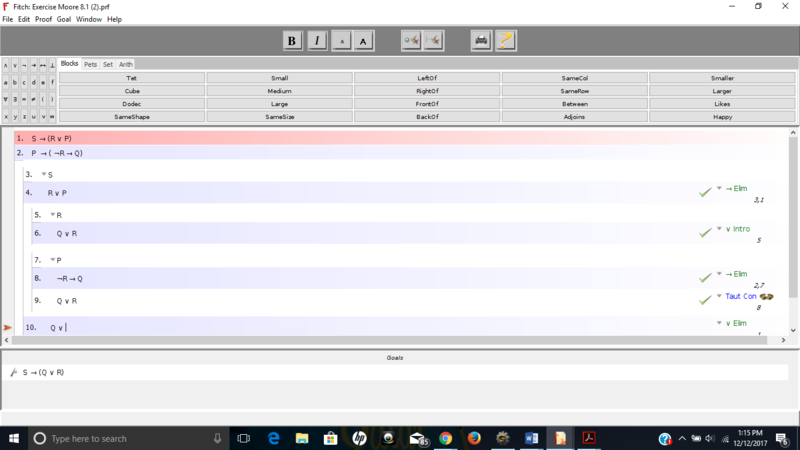 How to discharge an assumption?